Coherent state transfer is an important requirement in the construction of quantum computer hardware. The state transfer can be realized by linear next-neighbour-coupled finite chains. 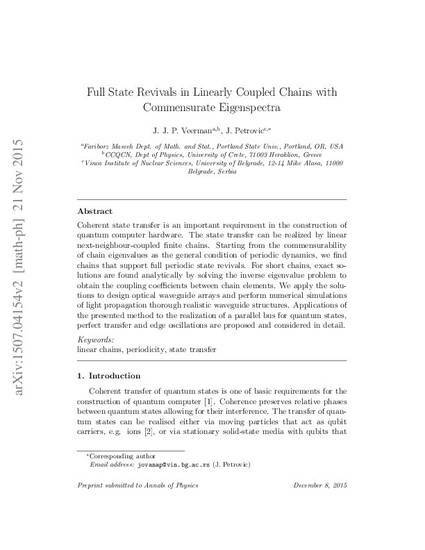 Starting from the commensurability of chain eigenvalues as the general condition of periodic dynamics, we find chains that support full periodic state revivals. For short chains, exact solutions are found analytically by solving the inverse eigenvalue problem to obtain the coupling coefficients between chain elements. We apply the solutions to design optical waveguide arrays and perform numerical simulations of light propagation thorough realistic waveguide structures. Applications of the presented method to the realization of a parallel bus for quantum states, perfect transfer and edge oscillations are proposed and considered in detail. Veermana, J. J. P., & Petrovicc, J. (2015). Full State Revivals in Linearly Coupled Chains with Commensurate Eigenspectra. arXiv preprint arXiv:1507.04154.